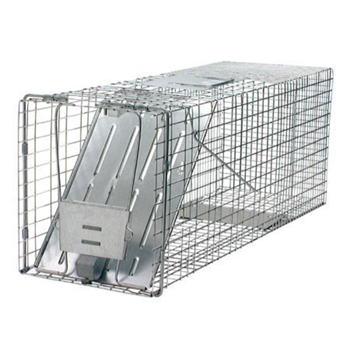 One-Door Groundhog Animal Trap is ideal for trapping raccoons, stray cats, groundhogs (woodchucks), opossums and armadillos. This product is designed and used by professional trappers. One spring loaded door for safe, secure catches. Animal control officers trust and use these live raccoon and groundhog traps. Mesh openings are smaller than competing traps of comparable size to prevent escapes and stolen bait. Spring loaded doors and sensitive triggers ensure quick, secure captures that target the specific animal's size, eliminating undesired catches.